Pardon the surge in baby related posts, but as you can tell, I am coming out of my denial: In about 10 days we will indeed have a newborn in our house. Time to get ready! UPDATE: I purchased one of these and it works like a charm! Gets my swissmiss two thumbs up! And yes, it works in a square sink. *Love* it! And I think tiny Tilo approves as well! I also love the design element and the flatpaking. The baby looks very relaxed and supported my only concern would be the tap being right over the baby particularly if its one of those lever temperature controlled ones there is a risk of it being accidently knocked and the baby being burnt by hot water. 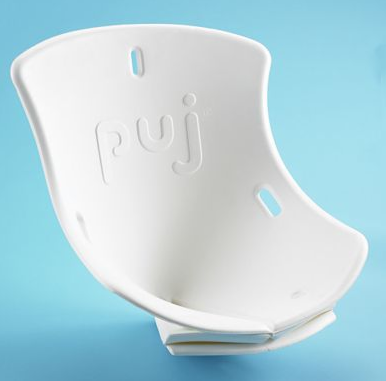 Other than that its great it would work quite well in a square tub as I would presume that the weight of the baby would help the bath maintain it rigidity. Good Luck with the baby we are expecting a new niece/nephew in a few weeks no.3 so a real mix of excitement and anxiety with the impending 3 to look after instead of 2. I wish you well with your arrival. Actually, I bet it would conform to the square tub- I think it is made of a flexible coated foam. I was so sad that these came out when my son was too big to use one already. It looks like a vast improvement over the gigantic plastic baby tubs. 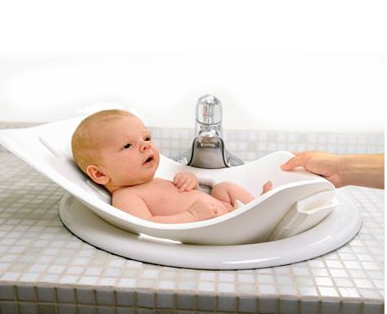 man, this is so much sleeker than the relatively big tub I’ve used for both my daughters. Oh, and congrats on the baby! Wishing you all the best for the greatest act of creation. And thanks for your lovely blog. We just got one for our newborn and it’s wonderful. I’m pretty positive it would work in a square sink! 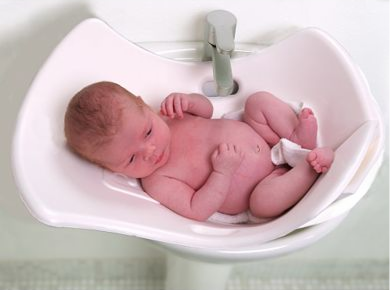 I also don’t like the tap directly over the baby like that in such a small sink …. though I guess you can make sure you’ve turned the taps really really tight before you put them in to make sure that no hot drips will escape. Obviously you’d fill it up before they went into it!